Oh my gosh, tomorrow is Thanksgiving. And Hanukkah starts at sundown tonight! This holiday season is all sorts of wacky . . . but that’s okay – I like wacky! I’ve never done a post like this before, but I get requests every year. So this time around, I’ve scoured the Internet to find the very most awesome gifts and goodies for every vegan kiddo that you know and love, from babies all the way up to tweens. Half of these items are things we own, and they come with the Waits Rebhal seal of super-fun approval. The other half are things that I’ve discovered, vetted, and can solemnly swear that I’m truly coveting. They all come with the Sayward stamp of eco-friendly/non-toxic/cruelty-free/hippie mama-bear approval! And just to be upfront, the links in this post are, as usual, affiliate links. That means that if you like this site and you’d like to support my work, you can click through the links and I’ll get a small commission on anything you buy. If you’re not comfortable using affiliate links, I get that, and I’m not trying to trick anyone here. So just open a new browser window and manually search for the item. Sound good? Okay – here we go! 1. Under The Nile’s Organic Fruit Basket. Oh and look, apparently they have an organic veggie crate too! So cute! Both are 100% organic cotton and certified fair trade. 2. Art for the Nursery or Plush Toys from Panda With Cookie. 3. Anything by Earth Mama Angel Baby. I used this line exclusively when Waits was little, both for him as a sensitive newborn baby, and for me as a healing postpartum mama. The whole EMAB line is vegan, cruelty-free, non-toxic, and as organic as possible. I loved all their stuff, but was especially fond of the Angel Baby Bottom Balm, the Angel Baby Shampoo & Body Wash, the Angel Baby Body Oil. And for mama-to-be, the Natural Stretch Oil. 4. These Crayon Rocks in an Eco Box look like so much fun! They’re basically just super fat crayons, but their unique shape is designed to strengthen the three-fingered grip in toddlers. I love that they’re non-toxic, they’re made from American-grown soy bean wax and made in America, and they’re colored with natural mineral powders. Perfect! One of our favorite books of all time! Waits first got this book when he was too young to understand it, but I’ve been reading it to him as he grows up and it’s become one of his very favorites. The art is gorgeous, the story is fun and poignant, and it’s written by an amazing woman and author – Nathalie VanBalen. Best of all, it’s currently on sale for only $10! By the way, that’s not an affiliate link, so feel free to click on through. Nathalie is the bees knees and really deserves your support! 6. This incredible Organic Edible Finger Paint. What a fantastic concept! I mean, we all know they eat it anyway, right?! Which is why We Can Too made their paints not only non-toxic, but absolutely food-based edible. Made in the USA from rice flour, rice cereal, and fruit and vegetable powders. They’re even wheat-free! 7. 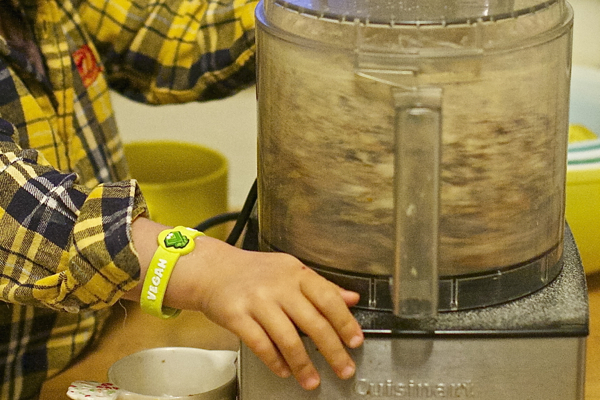 The super-cool Allermate’s Vegan Wristband power bracelet! Waits loves this bracelet, he says it has magic powers. I love it because it tells the whole world that he’s vegan, and helps to remind him to ask before he eats anything. 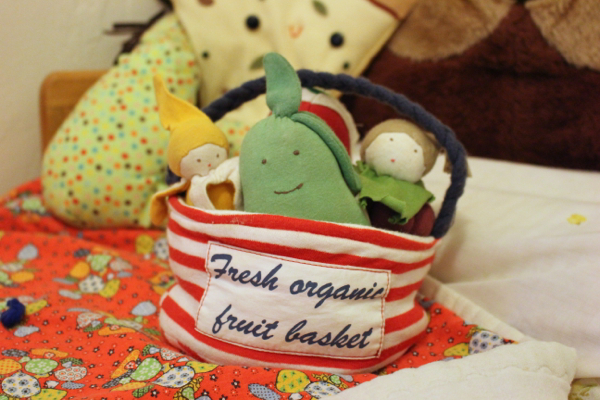 This is a functional gift that’s perfect for a wee vegan starting day care or preschool. And it may be functional, but it’s far from boring. Like I said – Waits has imagined this into quite the magical little toy. 8. Fun and fantastical Organic Edible Sidewalk Chalk. This stuff just looks delicious, doesn’t it? Swirly pastel creamsickle chalk made from edible bentonite clay and colored with spirulina, spinach powder, beet powder, annatto powder, blueberry powder, turmeric, pumpkin powder, and organic blue food coloring. Naturally wheat-free, non-toxic, and totally full of fun! 9. The Eco Friendly Artist’s Travel Kit from BeginAgain. We’ve had this kit for a few years now, and Waits absolutely adores it. Like, really really really adores it. It comes with a sketch pad made from recycled paper, a set of soy-based crayons, a recycled-materials ruler, and a bunch of recycled-materials stencils, all wrapped up in an eco-friendly canvas case. This is truly one of our favorites, and after a few years it’s proved itself quite durable to boot! 10. These flippin’ adorable shoes, the Earthwise Tiny Vegan Classics in Cranberry, by TOMS. Hoooooly cuteness Batman! These mini TOMS come in sizes 2 (infant) through 11 (kid), made of canvas and rubber, and like all TOMS they’re super easy to get on and off. Plus you know, the whole donate-a-pair-of-shoes-to-someone-in-need-thing. 11. 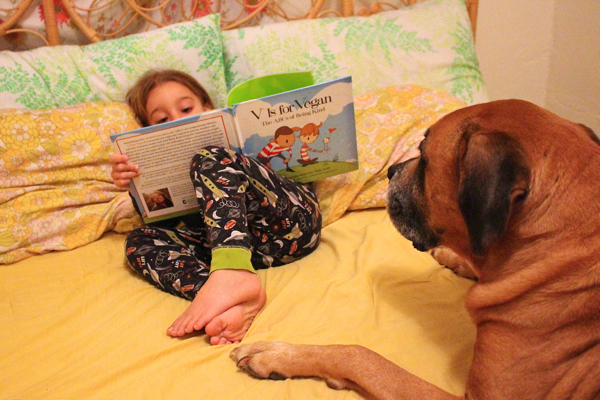 The untouchable V Is For Vegan, by Ruby Roth. This book is SPECTACULAR. 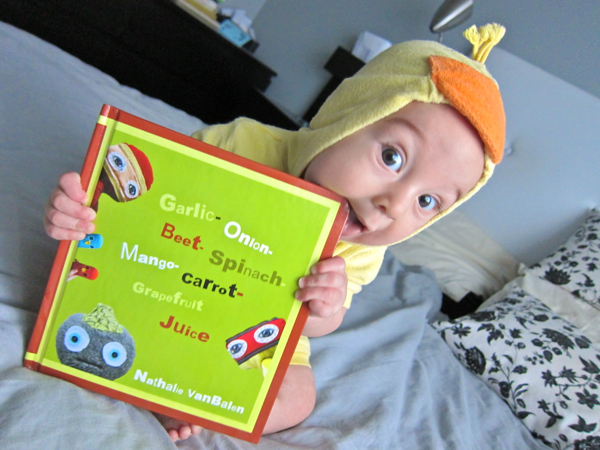 We have her first book, That’s Why We Don’t Eat Animals, which is aimed at slightly older kiddos. But V Is For Vegan is the absolute perfect primer for introducing vegan children to the many important concepts that make up their unique lifestyle. The art is amazing (as always – Roth is really talented) and the rhyming alphabet theme of the book makes it a pleasure to read. I couldn’t recommend it more! 12. The coolest clothing on the block, from Herbivore of course! Herbivore makes amazing vegan tees – and more – for big vegans and little vegans alike. They have a variety of onesies and tees for vegan kiddos, all screen-printed with beautiful messages of compassion. Browse the site and support some truly amazing people – and hey, you may just stumble upon some pictures of wee Waits playing model! 13. Um, did you know there was a vegan board game called Fur and Feathers??! Okay, so this game is for kids ages 6 and up and my little man was definitely too young to really grasp it. We had fun throwing dice around and messing with the pieces, sure. But that’s not the point. Later, I was able to explore this game on my own and basically, I can’t wait for Waits to be old enough to play with me! And in the meantime I have a game date with my not-boyfriend . . . 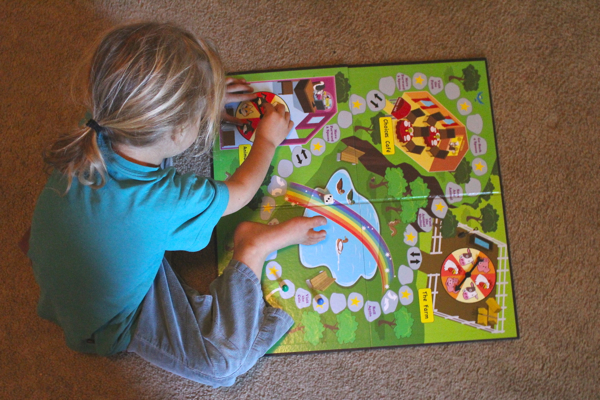 I love the concept of this game, which is to teach children about the importance of being kind to animals and the many ways that our daily choices impact the lives of other beings. But Fur And Feathers isn’t heavy or negative! Instead it’s just a friendly jaunt around the board, adopting shelter companions, learning fun facts about animals, and ordering cruelty-free foods at restaurants. Such important lessons, and really such a creative way of teaching them. Available in the Vegan Cuts Marketplace. 14. This safe and sassy Non-Toxic Kid-Friendly Nail Polish by Hopscotch. This would be perfect for children, sure, but I also kinda want to get some for myself! This stuff is pretty amazing: it’s non-toxic, vegan (duh), cruelty-free, gluten-free, fragrance-free, paraben-free, hypoallergenic, biodegradable, and comes in about a million different colors. Whew! 15. 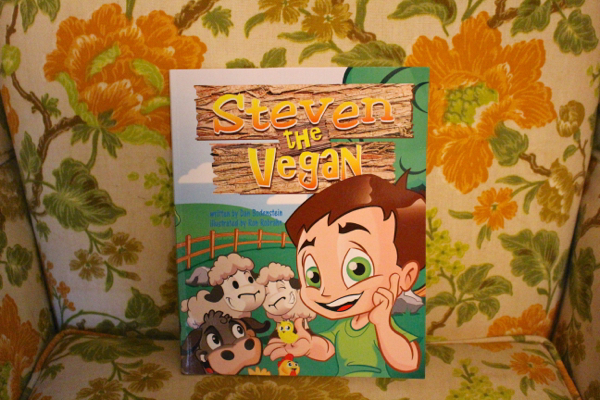 Perfect for readers a little bit older: Steven the Vegan. This book is geared towards elementary school children, and aims to help them explain to their peers why they are vegan. It’s such an important topic and one that can be pretty difficult for kids at such a vulnerable age. I’ve already started reading this to Waits and although he’s young, I know that we’re building a foundation for his future. As for now, he loves the cheerful cartoon-style illustrations and enjoys the general story line, which follows a class field trip to a sanctuary. Available in the Vegan Cuts Marketplace. 16. This adorable “Cruelty Free” Bunny Necklace. For the vegan pre-teen girl in your life, be she daughter, niece, or friend, you can’t go wrong with this beautiful little bunny pendant. Made from recycled aluminum and hand stamped with the words “Cruelty Free”, this necklace provides a chic and subtle way to wear your ethics on display. Available in the Vegan Cuts Marketplace. 17. A Vegan Cuts Snack Box Subscription! I’ve said it before and I’ll say it again: Waits and I ADORE this monthly service. Every few weeks a box arrives on our doorstep, chock full to the brim with delicious and delightful vegan goodies. You should see Waits’s eyes light up when he sees a new box has arrived! This really is a gift that keeps on giving, every month, over and over. It’s unique and unexpected and I guarantee, it’ll be a hit. 18. Stocking Stuffers! May I suggest Chewy Banana Bites, or a 6-pack of Rescue Chocolates, or an Om Nom Nom Cookie Sampler? Or if you’re feeling less like sugar, how about a sample pack of Vegan Cuts-inspired temporary tattoos? All available in the Vegan Cuts Marketplace. So no matter the age, there’s an awesome gift out there for any wee vegan in your life. I hope you found this list helpful, ’cause I sure had fun putting it together! And with that, I’m off to my family’s for the holiday. I’d planned to photograph all my delicious vegan Thanksgiving fare, but I’m wondering if you’ll want to see a WIAW from Thanksgiving, almost a week after the holiday’s over. Will you be burned out on T-day by then? Let me know in the comments, okay? Thanksgiving WIAW for next week: yay or nay? Yes! I always enjoy your WIAW! Love the gift ideas, too! 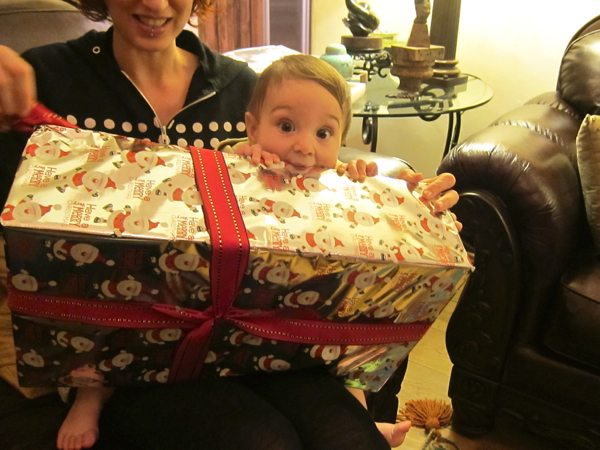 Love this list of gift suggestions! I’m always so sure that Ni has everything or that I’m on the up-and-up of what’s out there, but I’m seriously excited about adding that board game to our collection. She taught me how to play Risk a couple of weekends ago, and we’ve had Auf Dem Lande since she was a toddler and have made it into our own version of an animal sanctuary board game. Love this post and your new unboxing video! Waits is always soooo cute! And sure I would love to see Thanksginving pics! Yay for Thanksgiving WIAW! I’m interested to see what you’ll be feasting on. 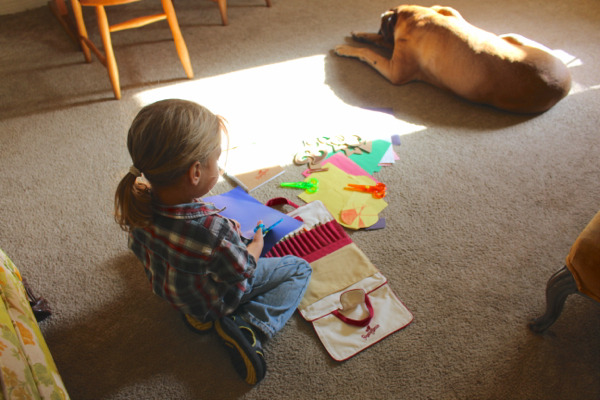 Since we don’t have Thanksgiving in the UK, I’d love to live vicariously through a WIAW post! Oh My Gosh! 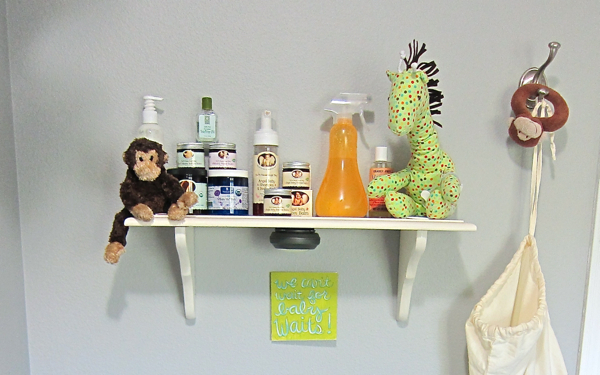 That monkey on the shelve is just like the one my son has had since he was 3 months old! He is now 6 and still takes “monkey” everywhere! Of course now Monkey is not has fluffy since it has had its share of washes but its just as special. After seeing that I cried through the rest of the post. I hope that you and your family have an AMAZING holiday season! Love the list and may get some of these for myself! I also would love a WIAW post next week on Thanksgiving. I am always curious about what other people do. And totally random, I love that the pup is in most of the pictures with Waits. I’m not sure if you’ve done a post on him before or not, but I would love to hear more about him! I have two dogs that I would like to try to go vegan with, but was wondering what it looked like in your house! I’m NEVER burned out from Thanksgiving. Bring on the holiday WIAW!! What a great list! I’ve got to try out those crayon rocks. Thanks for the love– hope you have a wonderful holiday! I’ve been wanting to ask you this as well:) I have a 10 year old German shep mix. I picked up the book “Vegan Dog Food” from Herbivore and ordered a giant bag of Vege-Pet but still worry I’m not doing it right. What are your thoughts/experiences with vegan dogs? Another vote for WIAW Tg edition! I have ornaments where part of the proceeds go to animal sanctuaries. Okay, it should be fixed now! Thanks for the heads up! Thumbs up to Thanksgiving WIAW. And please share where you got your kombucha tee. I love it! Another good gift list item. Thanks so much for mentioning my shop!! Hi KLo, the kombucha tee is from http://www.shangobrand.com/, and AWESOME little company! Pingback: Things I Love Thursday – Local Vegan Toronto Gift Ideas 2013 Edition | meshell in your city. Best article I have found about gifts for vegan kids. Thank you very much!